When Einstein developed relativity theory, he found a new way to describe gravity. It took him years to work out the math to find the solutions to his own equations, but they were only an approximate solution. The first complete solution to Eintstein’ unfinished equations was found by a theoretical physicist named Karl Schwarzschild in 1916. Significantly, Schwarzschild’ solution provided support for an extreme situation about the effects of severely compressed matter on gravity and energy. If an object have sufficiently compact mass then it can deform spacetime to form a strange but a fascinating thing called black hole, a region of spacetime with extreme density and zero-volume but all of its mass as a singularity — I know its hard to imagine something like black holes, don’t worry, even the thinkers of that period could not imagine it, the idea of a singularity troubled many scientists, even Einstein himself, he argued vigorously that black holes were incompatible with reality. In his work published shortly before his death in 1916, Schwarzschild also explained that a singularity was surrounded by a spherical gravitational boundary in spacetime that forever trapped anything that ventured too close to it, nothing can escape from inside it, scientists refer to it as “the point of no return”. This boundary was named the event horizon. Schwarzschild also presented a formula that calculated the size of an event horizon-known as the Schwarzschild radius. Until now we talk about some theoretical concepts of black holes but we never mentioned how a black hole born… So how do these strange objects form? Scientists say they are born when the center of a very massive star collapses in upon itself. The vast majority of our contemporary scientists believe that black holes exist but there are also some skeptics. Stephen Hawking is one of them. In a paper posted online on the arXiv preprint server on 22 January, Hawking claims that the notion of an ‘event horizon’ is incompatible with quantum theory. Quantum theory, however, “enables energy and information to escape from a black hole. In a nutshell, a black hole will never form because the gravitational energy required to create it (E=mc2) is greater than the equivalent energy of the mass. 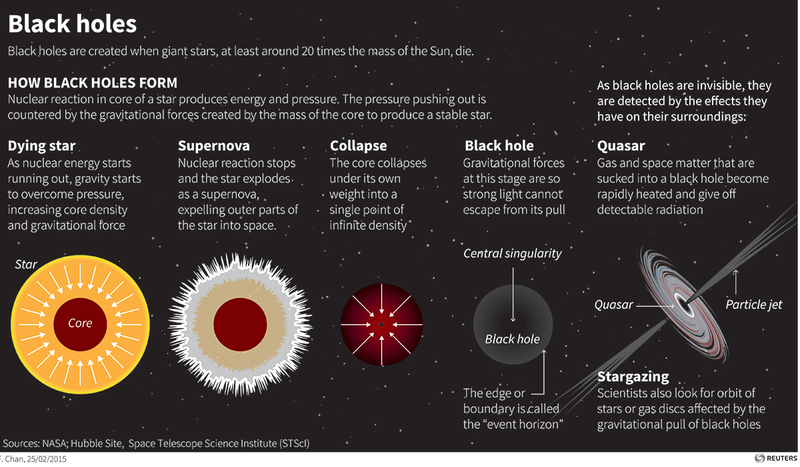 Every observer of a collapsing star will observe that the star will stop collapsing before crossing a critical radius (Schwarzschild radius) and becoming a black hole. However, an observer’s perception of the passage of time can vary significantly depending of the strength of the gravity field from which observations are made. From the perspective of a distant observer, the rate of collapse will slow down so much as the surface approaches the critical radius that the critical radius will never be crossed in finite time. This was the inception of black stars’ concept. So, stars that are collapsing toward forming a black hole but are frozen near the Schwarzschild horizon are termed “black stars”. A Black Star is a theoretical object alternative to the black hole, composed of matter. In contrast, as we explained, a “black hole” is a vacuum solution of Einstein’s equations and there is no matter distribution inside it except for the singularity at the origin. Collisions of black stars in contrast to black hole collisions may be sources of gamma ray bursts. Black star’ gamma ray bursts should be preceded by gravitational wave emission similar to that from the coalescence of black holes. When black stars do collide, they can be distinguished from black holes by the nature of the radiation. The infall of matter on to a black star will also lead to electromagnetic emission due to collisions of the matter with the matter making up the black star. On the other hand, matter that is falling into a black hole will not emit electromagnetically except due to collision with other infalling matter, as in an accretion disk. 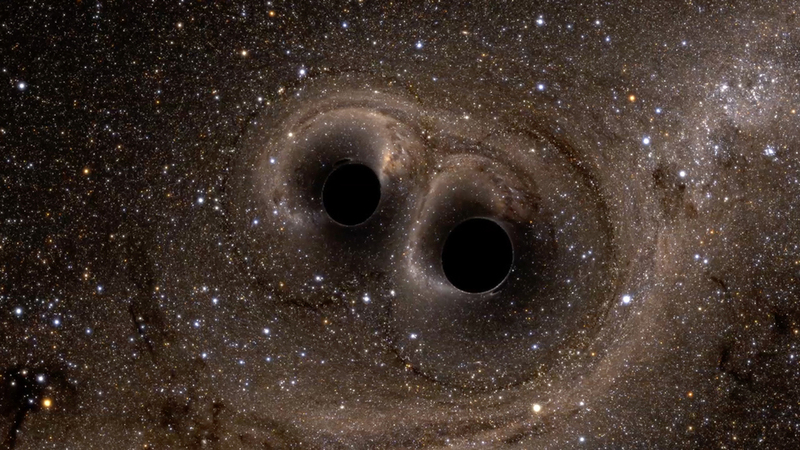 Recently LIGO has announced the discovery of gravitational waves that match the signal expected from the merger of two black holes, each of mass ~ 30 Sun’ masses. But soon after the LIGO event (0.4 s), Fermi has detected a gamma ray burst that is consistent with the interpretation of being an electromagnetic counterpart of the LIGO. In a new paper published online on arxiv server on 16 March, Tanmay Vachaspati profesor at Arizona state university, discuss another explanation for Ligo event, claiming that the black star scenario qualitatively fits the LIGO+Fermi observations. Although in his work, Vachaspati have found the black stars scenario is more suitable than the merger of 2 black holes, more accurate predictions and more observational data are expected in the near future to unravel this mystery. We can never be sure if the gravitational signatures are from colliding primordial black holes or from black stars whose matter is yet to collide. Study of black holes has always provoked a great variety of reactions from researchers. On the one hand, it is exciting to think that they hide within them the door to unforeseeable new possibilities in physics, albeit only for those who dare to enter. On the other hand, implications of black holes have long disturbed some physicists—the quest for alternatives to black holes. it is my belief that the gravitational lensing produced by these bodies actually shows the ‘dark-age’ of the Universe; the time between the Big-Bang and the expansion of the early universe. My head hurts; interesting though that the math worked out by Schwarzschild includes the theoretical possibility of the event horizon; is it that the singularity ejects E into a different dimension that caused by the dense nature of its existence. Black hole formation depends on neutron collapse and you must then force the surface of the neutron to accelerate faster than the speed of light to collapse below the Schwarzschild limit. This is not allowed as it would take more power than is available in the universe to accelerate anything faster than the speed of light. A supernova remnant, with a mass between 1.44 and 2 solar masses, contracts down to a neutron star. The internal pressure throughout the star becomes high enough to stop the contraction. With a higher mass, between 2.2 and 15 solar masses, the remnant will relatively contract down to a black star. It is commonly accepted that time comes to a standstill at the event horizon of a black hole. Calculations show that there is more to this picture when you consider what happened before there was an event horizon. If we go back in time when the remnant was 1.75 times larger than the event horizon and it is still contracting, the gravitational potential gets extremely close to the value that causes time to freeze starting the center. A relative freeze at any point, relatively stops all motion at that point which prevents it from crossing over to become imaginary where the time-like direction becomes the radius and the space-like direction becomes time. While the outer surface is contracting in, this ‘freezing of time’ cascades out, almost to the surface, creating a black star. This black star is made of solid matter with a fairly uniform density and without a singularity. The time freeze relatively stops the contraction of the remnant. This approach uses the Newtonian model while factoring in relativistic corrections derived from General Relativity (GR) such as the equivalence principle and, contractions of both time and space due to the gravitational potential. Now, what if we choose to ignore this ‘freezing of time’ in the creation of, let’s say, a ten solar mass remnant and let it contract further? When the radius reduces down to where it is only 1.4 times larger than the event horizon, the pressure at the center will get high enough to crush neutrons. The decreasing radius will cause the gravitational pressure to increase further, causing a collapse of the whole remnant to a singularity; thus, creating a classical black hole. It would also obtain a singularity if the problem is solved relative to points within the black star rather than relative to a remote point. This might relate to why a singularity is obtained when using tensors and the conventional methods of solving GR. Answering this question might make a good thesis topic. I don’t think we should ignore the ‘freezing of time,’ which is backed up by math. 1. Why we have very few intermediate-mass black stars, which are typically expected to fall between the largest stellar black star and the smallest supermassive black star. 2. How solid neutron matter makes up the volume of Stellar Black Stars, and how gas or plasma makes up the volume of supermassive black stars; thus, creating black stars without a singularity. 3. Why the surface of a black star is not quite ‘frozen in time’ and thus does not have an event horizon. 4. Why a ball of gas larger than 4 million solar masses directly collapses into a supermassive black star without having the interference of fusion that creates stars. This allows for supermassive black stars to be created in the early universe.